Click on image to see higher resolution version. That which unites the Grissom, the Chaffee and White Parks –the three astronaut parks– is a trail officially called “Parks Road Trail”. 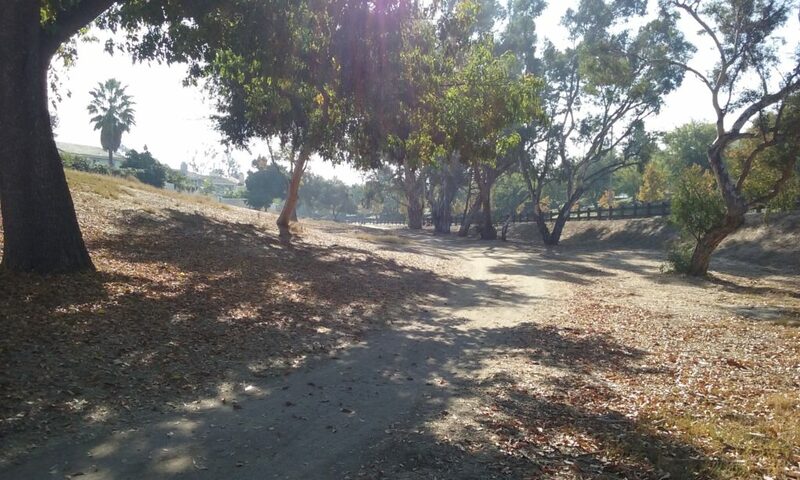 It is a very significant part of the famous 11 mile Fullerton Loop. Famous anyway among Southern California bikers. At one end Park Road Trail becomes Rosecrans Trail. This happens at Tree Park (the top red arrow). Tree Park is an important reference point for several other trails. It has plenty of parking, benches and a view. The other end of Park Road Trail, alas, doesn’t turn into another trail, there’s no view and no park there either. (The lower red arrow.) For the bikers, this lower part of the trail goes onto roads for a while. 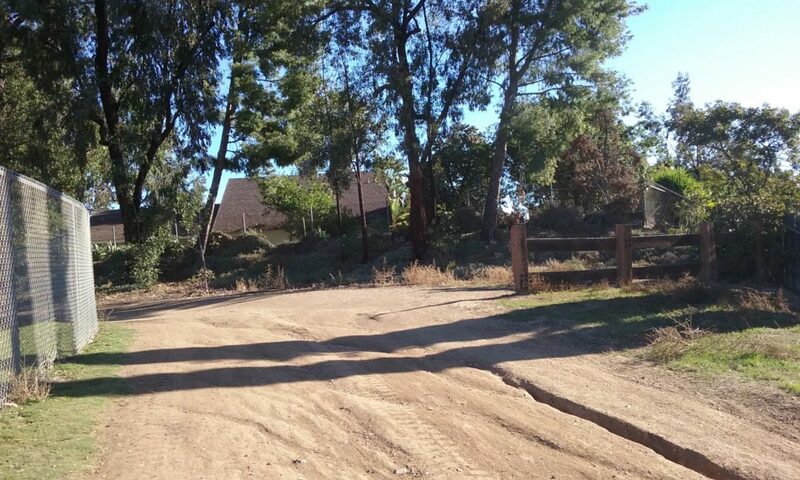 In fact this is the most confusing section of the 11 mile Fullerton Loop for them. Although there’s nothing of interest to walkers, just a block north parking is excellent right along the street, so this end as a starting point is pretty good. And it allows Tree Park with its great view south and west to be a worthy goal. 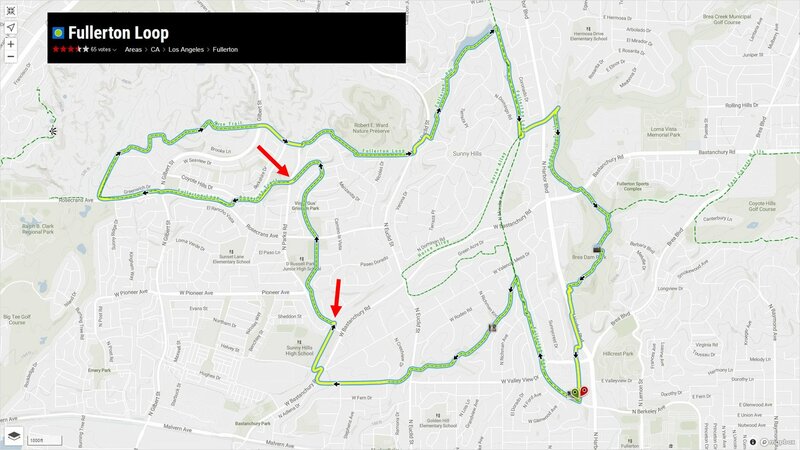 What is about to be described is a 2.2 mile walking journey through a section of the 11 mile loop for bikers. After that there is a rather large photo gallery where the focus of attention is the three astronaut parks rather than the walk. The official start of the Parks Road Trail. Just as a philosophical reminder, in case it occurred to you that having three parks near each other in one end of town seems dumb . . . parks and trails are left-over property. Cities could never afford that much land if it wasn’t in someway of little value to developers. Parks and trails may seem like the purpose of life to us, but it only takes a second’s observation to see how few people occupy so much land to realize that the highest purpose of a park is just knowing it’s there. And that can be appreciated by just driving by it. And those that drive by it, are for the most part the tax payer who pays for its upkeep. Click here –> for more on trail philosophy. 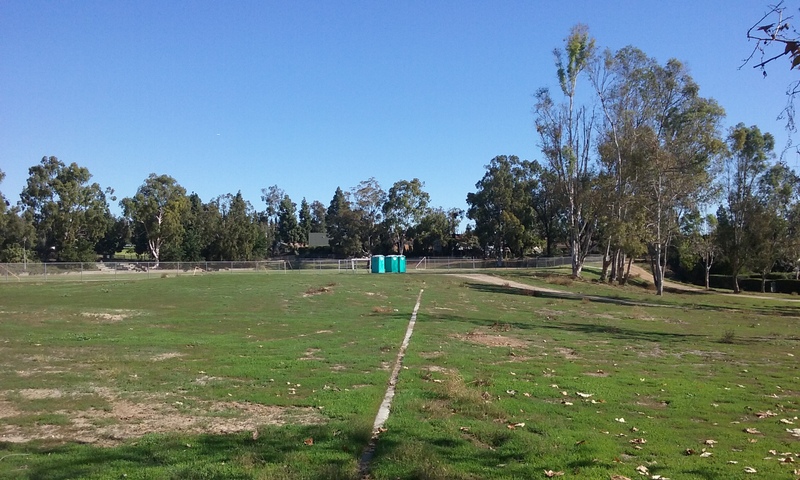 Grissom Park is the longest “lawn” park in Fullerton. There’s two trails that go uphill within the park. They are only inches apart so it begs an explanation. One is a very narrow dirt trail that is hard packed by thousands of bikers and walkers. It is right next to an expensive asphalt trail that no one ever uses. (Park architects are famous for not knowing how they look from the ground many years later. And they only see the park they are designing from the equivalent of 1,000 feet high. They can’t resist making it look good with concrete. This–> example of dumbness you will be glad to know is not in Fullerton.) Bikers don’t use the architect’s trail on Grissom Park because they complain that the tilted asphalt tears up their tires. Walkers don’t like it also because it is tilted. 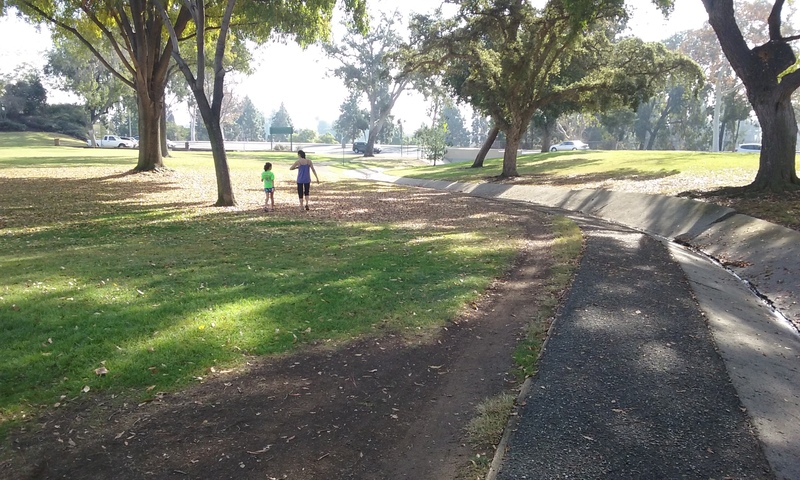 ____There’s a fascinating third alternative; walk on the grass anywhere on the full width of the park, like the mom and daughter in the picture above. This is what happens automatically on a golf course. Golfers walk to the random places where their balls land. 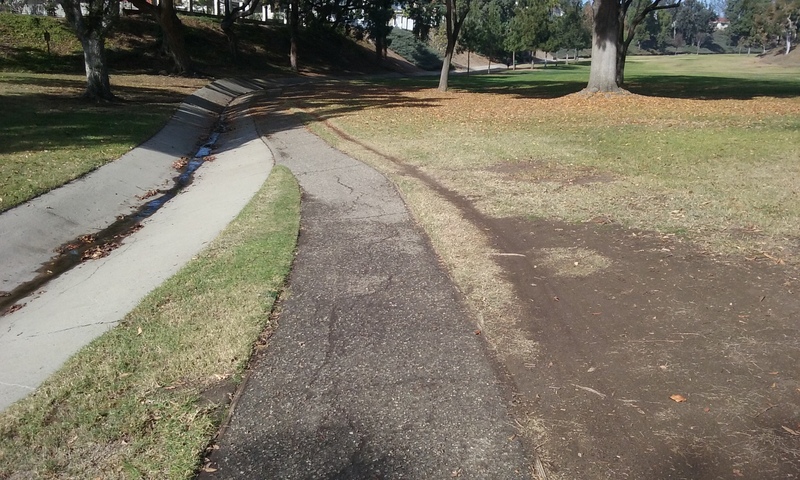 This would result in a park with an invisible trail. This is unlikely going to happen but it is presented here to illustrate what the Sierra Club advises hikers to do in areas they are exploring that doesn’t have a trail. Normally having no trail can be very disconcerting; not knowing which way to go. But here it is clear which way to go because the park width is less than its length. The park gets narrower where it can’t helped but to have a trail. At that point, every effort should be to get on a trail. Just before leaving Grissom Park is a rather steep climb. The trail continues across a street still going up. Now it becomes a real trail, with dirt and ruts that makes the walk real. The trail curves to the left a lot, eventually heading south and west. You will emerge at Camino Del Sol. 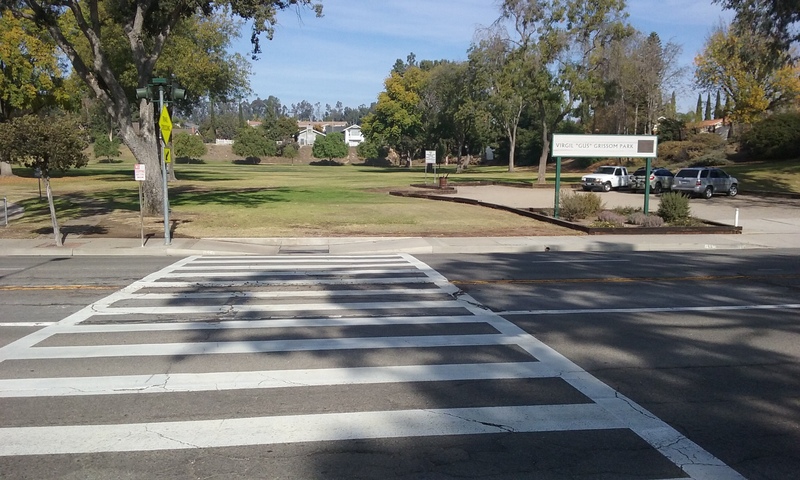 You could jaywalk from there across Parks Road to Tree Park, but instead stay on the east side of Camino Dell Sol and continue on the trail past one more house where there’s a crosswalk across Rosecrans. Cross there and find your way to the park benches that used to have an incredible view. They had a fabulous view when the park was new, but the trees were watered there and now entirely block the view. Three benches, cast in concrete with no view whatsoever. Not even the sky is seen unless you tilt your head back. There are other trees that block the view of the rest of the park. In fact most of Tree Park can’t be seen until you are well along the walk down there. The trail down is named Rosecrans Trail. There’s now two trails down, thanks to the pioneering effort of the bikers. The one maintained by the city is wide and steep at first. The other starts higher up (to the south) and gets steeper at the end. Tree park is a low spot that naturally catches rain so the shrubs and trees are amazing there. Wander about as much as you like. 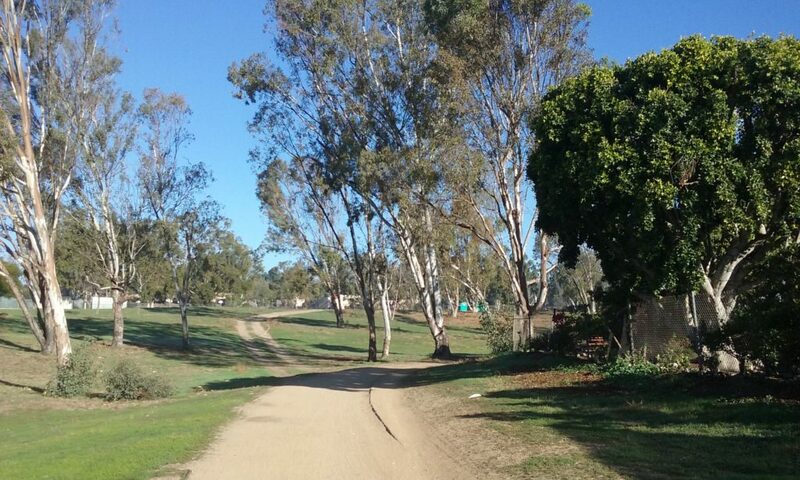 The official path of Rosecrans Trail continues on as sidewalk, but there’s nothing as interesting as Tree Park. So if you turn around at the bottom of Tree Park it’s 2.2 miles out-and-back. Click on the pictures below to see them full screen. Parking OK on Parks Road next to Edward White Park where the sign is. Edward White Park just after a rain. Notice how much use this trail gets. This don’t forget is part of the Fullerton Loop. At the north end of White Park is an extremely flat surface that is just begging to be a kids free putting green or something. Here’s another view of that billiard table flat surface at the north end. Edward H White Park is probably the most beautiful no-lawn park we have. How about turning it into a dirt-based Frisbee Golf thing. Where the trail picks up again at the north-east corner of White Park is triangular space that’s just begging for something to go there. Here’s that same triangular space that needs a rock garden or a giant bolder or a sign or something. 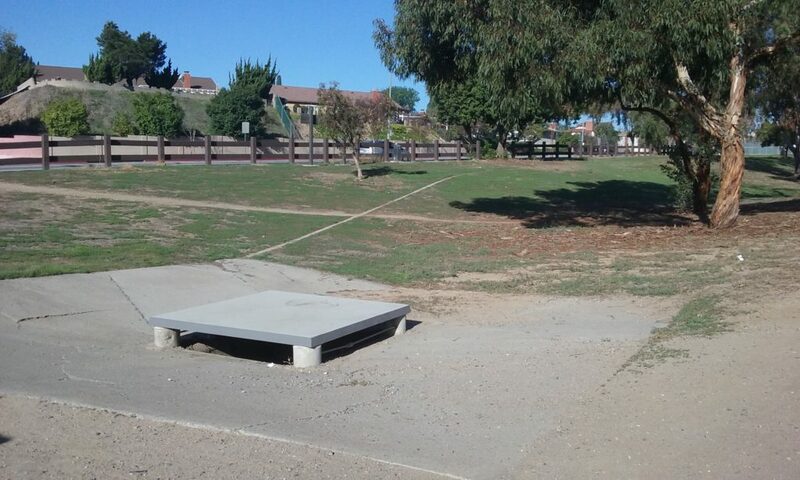 The mystery for this park is what are those concrete runners for? The square plate is a cover for a drain. Does the runner have to do with water? This was taken on the trail looking north. On the left Parks Jr. High and on the right is Chaffee Park. Chaffee Park looking east from the trail. 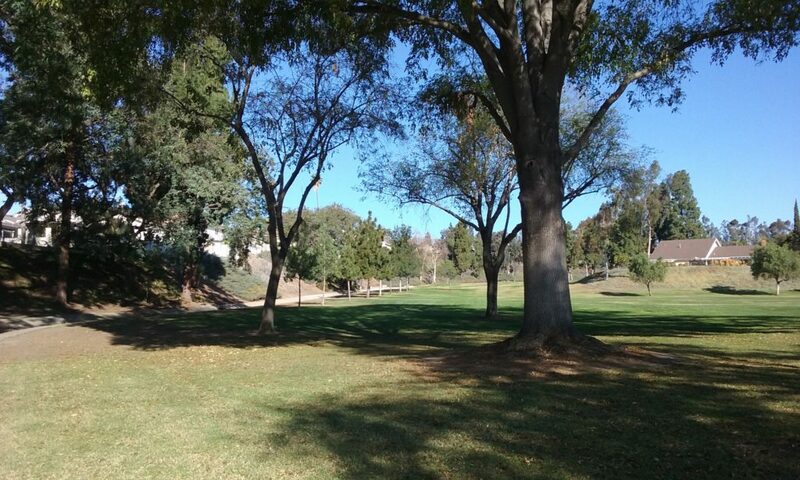 Hills are OK for Frisbee Golf, but its not big enough a park for that. 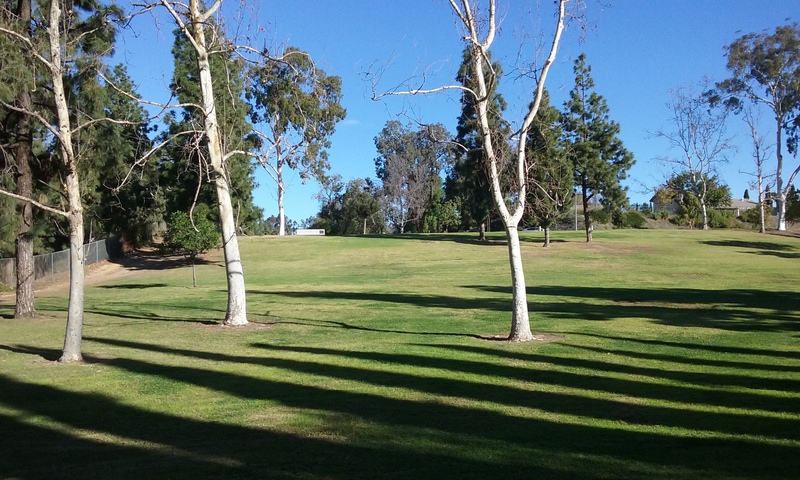 Chaffee Park looking north, up hill. Would lawn bowling work on a slope? How about croquet? 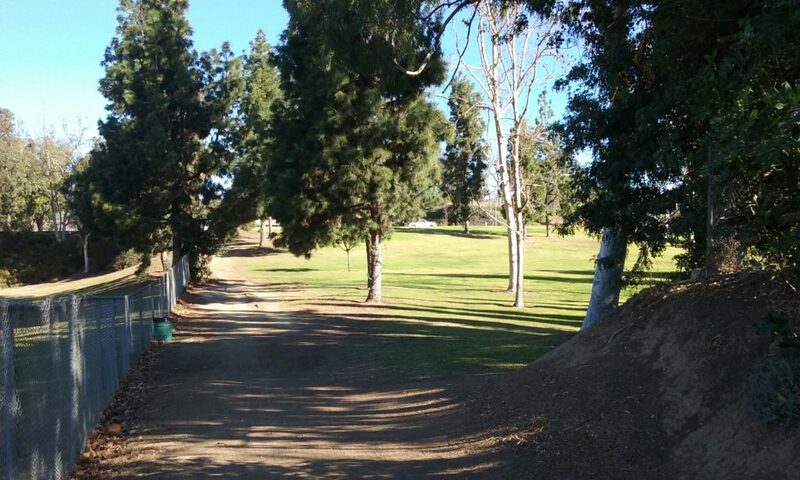 This is at the top of the trail looking at Grissom Park across Rosecrans. There’s parking but no bench. Not even a log to sit on. When tired from a long walk a park bench would be nice. This place is half way to either end of the Parks Trail. 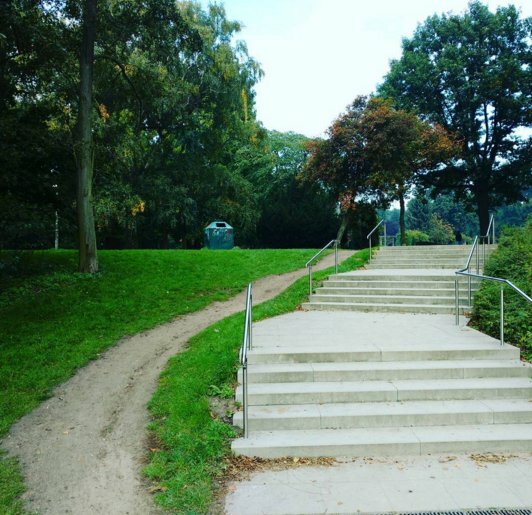 Notice how people avoid the trail the Park Architect “planned” for us. This picture is a place holder. 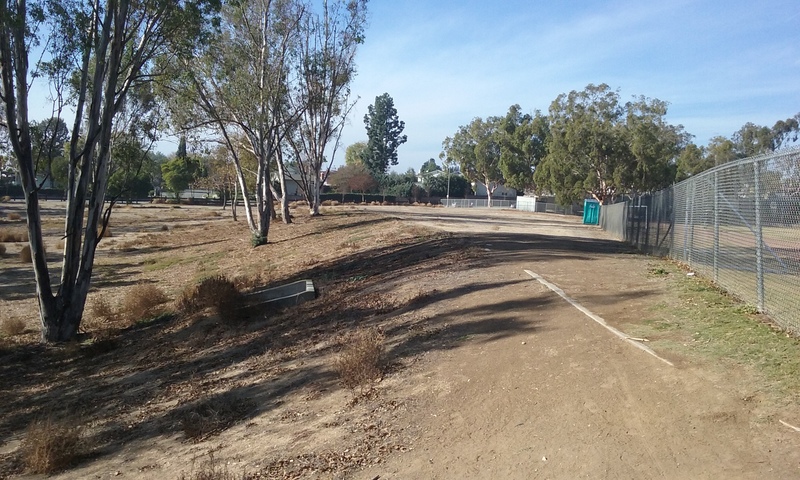 There’s a decorative wood fence at right angles to the trail at the south east corner of Parks Jr. High. It is an excellent definer of space for the trail and quite visible from a long way off because there’s no trees blocking the view of it. 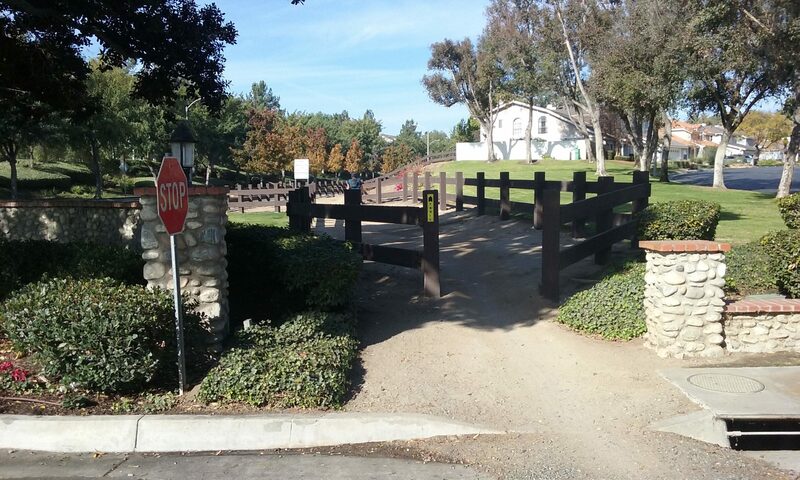 But that decorative fence also brings attention to a triangular space that is dying to have something there. 33°53’24.3″N 117°57’03.9″W. That would give the decorative fence a reason to be there. How about large decorative rock or a plaque which tells the origin of the three park names. 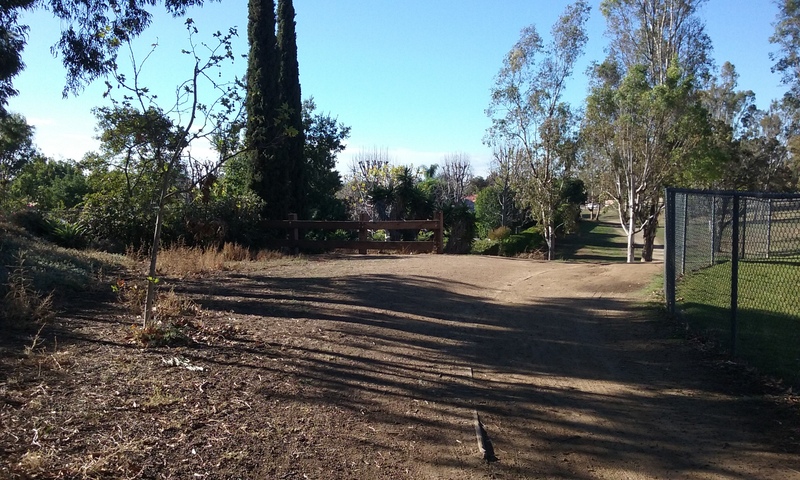 There is a kind of grand entrance to the Park Road Trail where N. Peacock Lane crosses Parks. A block or so farther up is a divide in the trail with no advice whatsoever. 33°53’12.8″N 117°57’04.0″W. This is a major trail divide which kind of demands some attention. 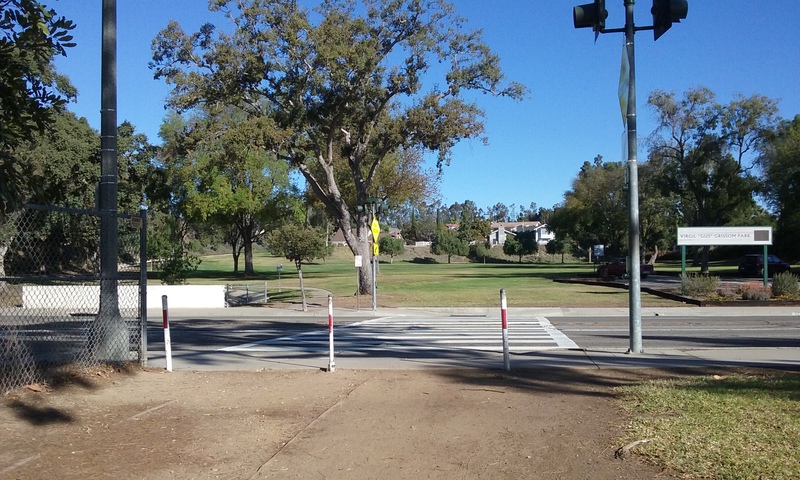 How about a sign that says something like “Left to Pioneer Ave Trail, Right to continue Parks Road Trail”. Please find a better name for the trail besides Parks. There’s too many things called parks. Let’s see, a trail that goes through all three Astronaut Parks. Gee I wonder what we can call it. The asphalt trail that goes the length of Grissom Trail is an excellent example of what never to do. Never tilt rough asphalt expecting it to be used by people. When asked of a biker why you don’t use it, they all say the same thing. Tilted asphalt tears up the tires. People who walk much prefer dirt or grass. The problem is the constant angle of tilt. Rough ground may have greater tilt angles, but it doesn’t put the load only on one side. Edward H. White Park is the least developed of the Astronaut parks. It is free of weeds, which takes some maintenance, but appears to be an uncared for park. It has potential for being the most beautiful park because of all the tall trees. 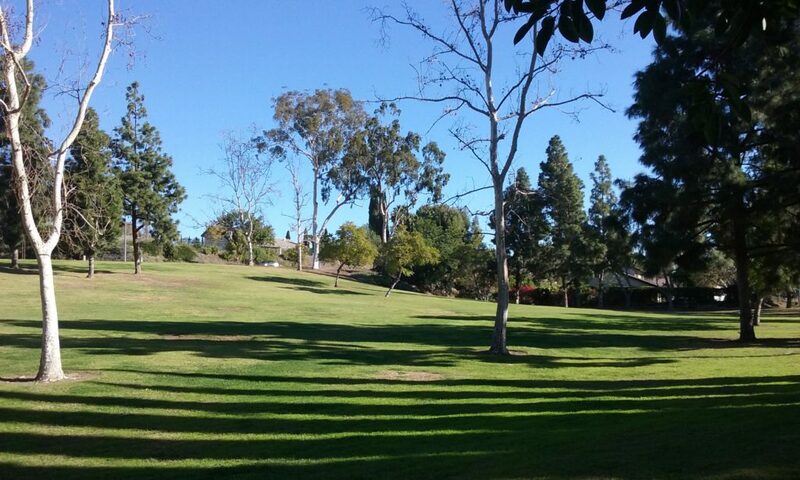 When it comes to judging what park can have its green grass restored it should be realized that not only is this park seen by commuters on Parks, but the trail through this park is part of the Fullerton Loop. . . several hundred bikers per day. But in the mean time, can the park while it is just dirt, be used for people to play Frisbee Golf? Just south of Parks Jr. High running track is a very flat area that is in the Edward White Park. Its flatness just begs something be done with it. How about a public use putting green? I interviewed the general manager of Fullerton Golf Course and he said putting greens are terrible for maintenance and regular grass doesn’t roll right. He said there is an artificial putting green material used by miniature golf courses. I think having decorative entrances to trails are very important. A decorative fence, visible from the road that marks the start of a trail is all you really need. It needs to be only a few dozen feet long. This much fence works better than a sign. There’s a perfect example of that across from Tree Park where Parks Trail ends or begins. 33 53 53.0154 -117 57 8.2836 Alas it is buried behind brush. I think the brush should be removed and bark laid down to keep it bare. Again. No need for a sigh. Just make the short length of railings visible. 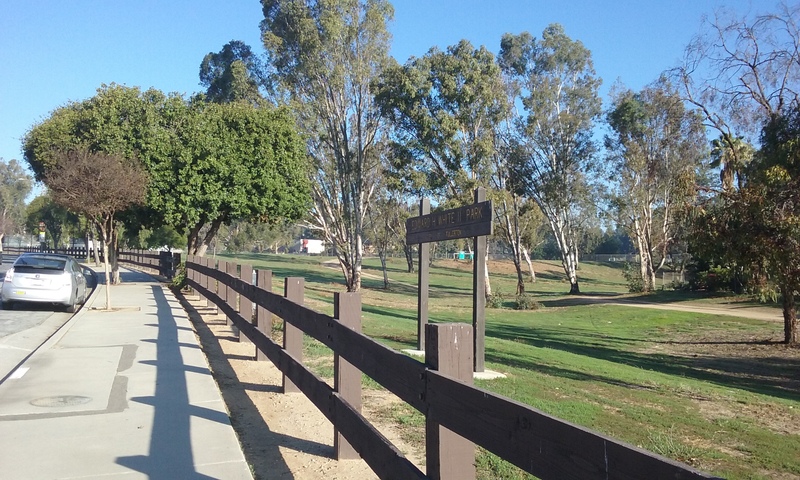 The main entrance to Grissom Park on Rosecrans, is something of a designated place and not just a sign along a trail. There’s a parking lot there which make it look like a “place.” After a long walk from either direction one is disappointed to find nothing to sit on. It sure would be a wonderful and welcoming sight (even if not used) to see a park bench there.